Recruit Readers: Take the Summer challenge and get five people to sign up for CAMEO’s Must Know and help expand the influence of the microbusiness sector. Happy National Black Business Month! Register for Small Business Recovery and Resilience After a Disaster on Thursday, August 16, 2018, at 2:00 pm. The fires raging up and down the state have proved devastating to many communities and has forced evacuations. Our thoughts go out to our friends in Redding, Mendocino, and Lake County – as well as all the other areas that are experiencing the effects of the fires. After last year’s fire season and the start of this year’s, we’re living in a new normal. Last July saw 112 fire incidents, the year before 24. Fires and other disasters (earthquakes, floods, etc.) have a profound effect on local businesses. Don’t wait until it’s too late, prepare now. To help you do that we’re gathering a panel of disaster program experts and CAMEO members that have had to respond to “Declared Disasters” and have experience delivering the appropriate services to their clients that have been affected. If you are not the person in charge of submitting data for your organization, please forward this email to whomever that might be. We’ll be forever in your debt. From FIELD: if your data is uploaded and approved by August 30, they will upgrade your microTracker subscription from basic to premium for one year, which gives you access to data analysis tools and reports to share with your board and funders. From CAMEO: if you fill out the Census, CAMEO will treat you and your staff to a free lunch. Email Andrew for details. 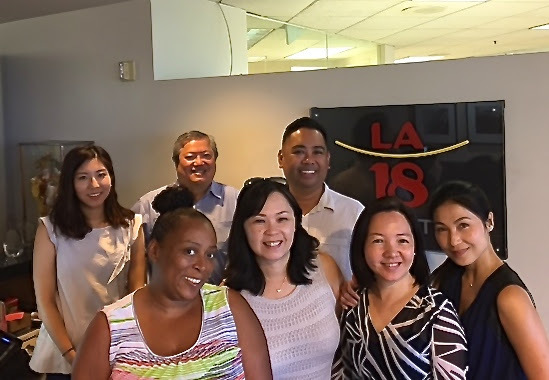 Last year Asian Pacific Islander Small Business Program staff went to Darya’s in West Los Angeles. You rely on CAMEO to advocate on behalf of the sector. We rely on you for your data. This data fuels our advocacy and supports our members at the state and national level. The better data we have, the stronger our case is, and the easier it is to express the vital role MDOs play in the small business sector. You can also participate in EntrepreneurTracker for 2018. FIELD at the Aspen Institute is continuing enrollment for the 2018 EntrepreneurTracker client outcomes survey. Indicate your interest, and they will reach out to you with more information. Training starts in late September. Support SBA’s Program for Investment in Micro-entrepreneurs (PRIME). The House passed their appropriations funding for this program for FY2019 at the same level as FY2018, which was $5 million. The Senate version, which was unanimously approved in committee, cut funding for the PRIME Program to $2.5 million. This bill now awaits a vote by the full Senate. Although the Department of Labor (DOL) stated that entrepreneurship training is covered by Performance Accountability in Workforce Innovation Opportunity Act (WIOA) programs, DOL has yet to release examples of “supplemental wage data” to be included in performance metrics. Please ask your members to urge DOL to view entrepreneurship as job creation. Download the Summer Federal Recess Packet for 2018. Member Kudos / For Your Clients: CDC Small Business Finance developed a primer for small business who “Want to Get an Online Small Business Loan?” It’s a great resource to share with all your clients! Grant Opportunity: With the support of JPMorgan Chase, NALCAB – National Association for Latino Community Asset Builders will provide grants of $40,000 – $50,000, technical assistance, and training to up to ten non-profit organizations for a period of 18 months to develop and implement data- and community-driven action plans for equitable development. Plans will prevent involuntary displacement and increase access to wealth generating assets for low-income communities through strategies including, but not limited to, affordable housing and/or commercial real estate development, policy development and advocacy, affordable housing and/or small business lending, housing services and programs, small business development, and community engagement. Download the Request for Proposals: Equitable Neighborhood Development Planning. The deadline is August 5, 2018. Funding Opportunity: Applications are open for AEO’s Tapestry Project. The project includes two opportunities: 1) Tapestry Project Innovation Registry (TPIR) will register your project to help broaden the reach of your organization’s work to funders, investors and other potential collaborators; and 2) the Tapestry Project Action Lab will support collaborative funding contracts, with awards of up to $50,000, organized around a shared business development objective that addresses the interlinkage of the three barriers for Black businesses reaching their potential. Click on the website for more details. The deadline is August 7, 2018. CAMEO Webinar: NALCAB hosts CAMEO for “Using Microloan & Community Advantage to Strengthen your Small Business Programs” on Wednesday, August 15, 2018, noon PT. Susan Brown and Mark Quinn will be giving an introduction to both SBA programs for the NALCAB audience. Feel free to join!